Movie Review: Drive- An Elegant yet Graphically Gritty Neo-Noir That is as Immaculately Stylish as it is Violently Unnerving | Generation Film! It’s a difficult task to take up the style and genre of the noir seeing as how it’s an elegant way of showing the darkness and depravity of how man corrupts society. It seems appropriate that such a classic symbol of Hollywood filmmaking would be the first genre Danish director Nicholas Wending Refn would explore for his American cinema debut. His latest film entitled Drive is a continuation of familiar themes seen in all of Refn’s diverse yet barbaric pieces of cinematic work such as the ethereally atmospheric film Valhalla Rising, the bloody and vicious Bronson, or the gritty Pusher Trilogy. 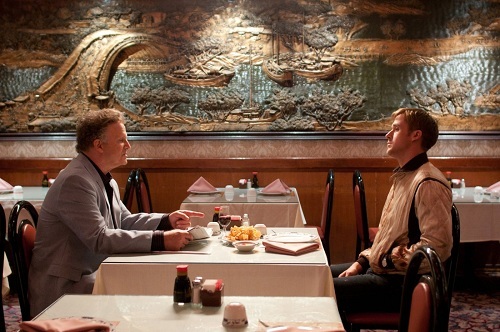 In Drive, there is a noir staple of the isolated and emotionless protagonist played with extraordinary subtlety by the talented Ryan Gosling who finds a glimmer of hope in the possible connection with a neighbor and her son. When she and her son are threatened by a group of gangsters that feel they are linked to her husband’s debt he feels it’s his duty to protect them, no matter the cost. This film is superbly shot with immaculate precision that accentuates the anxiousness and unnerving scenarios the Driver gets involved in. Throughout the film there is a tension that is unending and can be credited to the craft of Refn’s impeccable direction and consistent tone. And once the violence begins it is graphic as it is shockingly quick, reminiscent of the Coen Brothers or even Chan-Wook Park. 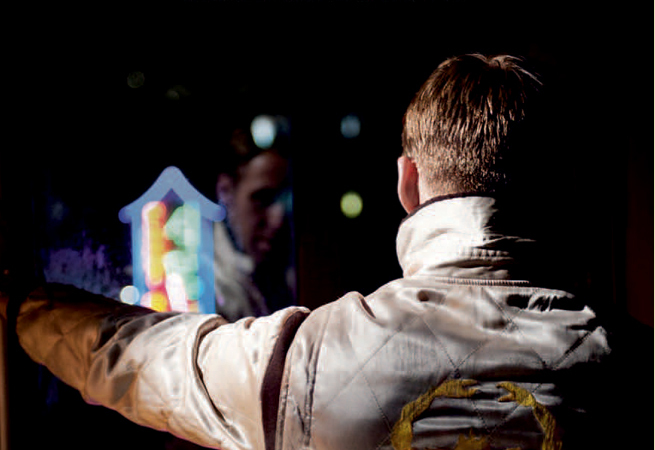 Drive proves that in Hollywood there can be original thoughts and inventive delivery that is all complimented by the credible acting, the nail biting moodiness, and the detailed character driven script. 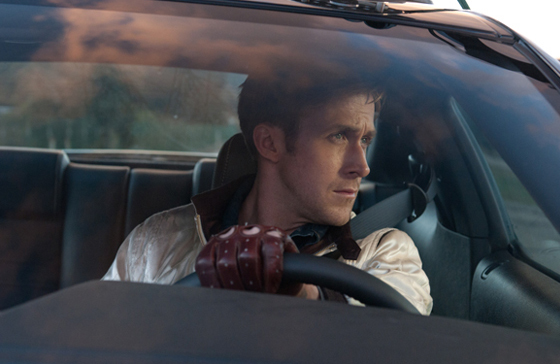 Drive opens up with a barely any dialogue introduction to the protagonist as a wheel for hire escorting two robbers from a crime scene to possible escape. Throughout the tension building drive in an effort to get away from the police there is a calculating efficiency to the driver’s abilities that showcases that sometimes extravagant Hollywood car chases get everything wrong. This getaway seems entirely realistic as it is occurring and introduces us to our nameless protagonist in a way that copious amounts of dialogue couldn’t do any justice. But not only does it efficiently put us into the lonely and dangerous world of the Driver, it also introduces American audiences to the tactful, thought-provoking, and character driven style of director Nicholas Wending Refn. He gracefully gets us involved in a Los Angeles that is unfamiliar to us while not being alienating, which is remarkable considering the high tension of the film, the lack of dialogue (mostly a benefit if you consider most modern films), and the intense graphic nature of the violence. Everything that could be highly divisive serves as a complimentary addition to a film that has a surprisingly original noir script. There should be praise to Hossein Amini’s adaptation skills from James Sallis’ book giving us a script absent of unnecessary dialogue and filled to the brim with revealing character scenarios. But all of these positive attributes from the start could have been ruined if not for the competent style of director Refn. All of this is of course complimented by a cast that is surprising, diverse, and extremely good. From television’s Bryan Cranston to stand-up comedian Albert Brooks, everyone utilizes the gritty atmosphere to their full advantage. There is definitely a subtlety at hand that could confuse lack of exaggerated acting for none (say for Carey Mulligan) but that is far from the case. This is a full on tension filled thriller that will unnerve you even in its most innocent of scenarios. Again, noir is an elegant and stylish way of showing us the darkness in man, whether it is Polanski’s Chinatown or Wilder’s Double Indemnity. With the return of this stylish genre with modern neo-noirs Refn’s first American film is a welcome addition to the success of how elegance and grittiness can be complimentary to each other. There is a precision to the shots as well as the driving sequences that is a parallel difference to the bloodiness of the violence and the hidden darkness of our protagonist, yet they all seem to flow together quite nicely. There isn’t any unnecessary banter or devotion for happy endings in this practically soulless thriller, which is to say it certainly stays true to Refn’s calculating character dramas and makes it an original welcome to a year filled with repetitive drivel. There is plenty to admire in a film that makes you sit on the edge of your seat even in the most benign of moments, because the world we’ve just been manipulated into experiencing is one of absolute coldness. For some that doesn’t seem like a welcoming theater experience but Drive is a unique neo-noir experience that showcases its strengths by abandoning most of Hollywood’s conventions in a genre that is most identifying to Hollywood. Can’t ask for anything for refreshing than that.